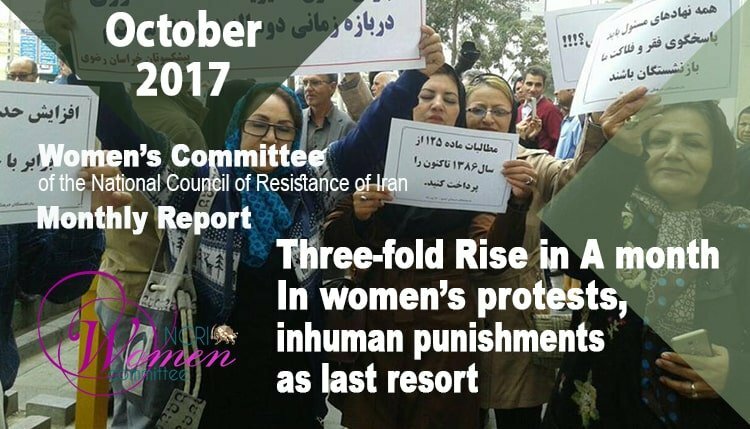 Women’s active participation in all the protests in the month of October, and their leading role at the forefront of the demonstrations underlined women’s impact on the anti-government movement in Iran. The largest number of protests were staged by plundered people whose savings and deposits have been looted by state-backed financial institutes. They staged sit-ins for consecutive days in the capital and various cities. Women took part even with their children at their side. On October 23, thousands of plundered people from cities across the country converged in Tehran and marched towards the mullahs’ parliament where they demanded to have their money back. The social atmosphere was extremely volatile in the month of October. Women actively participated at the forefront of at least 89 protests in this month. Compared to the 27 protests in September, this shows more than a three-fold increase. And compared to the average number of monthly protests last year (8.5), it shows more than a ten-fold increase. Based on the data collected and registered by the Women’s Committee of the National Council of Resistance of Iran, women participated in at least 32 protest demonstrations by looted people, 19 by teachers and 16 by students. Another issue which caused concern in the month of October, was the arrest and detention of a civil activist in a mental hospital. This coupled with extrajudicial sentences of flogging and forced labor issued for women who had used the social networks raised alarm over the regime’s use of inhumane punishments to crush women who dare to break its medieval social norms and codes of conduct. Almost all women political prisoners in Tehran have been to the women’s prison in Qarchak, Varamin, at least once and experienced the inhumane conditions of that prison where dangerous criminals are held. In other cities, there is no such thing as segregation of the crimes and prisoners detained on political grounds are kept in the same place along with ordinary criminals. Other means used by the clerical regime to impose further psychological pressure on political prisoners and their families include long-term solitary confinement to isolate the prisoner from the outside world, detention of the prisoner with undetermined status, spreading rumors, and intimidation of prisoners or their families regarding the fate of their loved ones. Political prisoner Leila Mir-Ghaffari (civil and children’s rights activist) experienced yet another inhumane treatment. She was arrested by security forces on September 26, and badly beaten up. Subsequently, she was transferred to Tehran’s Rouzbeh Mental Hospital. The hospital has a ward used by the Intelligence Ministry and controlled by its security agents. They handcuffed and shackled Ms. Mir-Ghaffari and chained her to the bed. Except for short periods when she was taken out for fresh air, Ms. Mir-Ghaffari was constantly held in this condition. She was also forced to take medications used for patients with psychological disorders. This severely damaged her mental condition and she was not able to speak for some time. In a brief telephone contact with her family on Thursday, October 26, 2017, she said the quality of food and hygiene in the hospital was terrible. She said the treatment of mental patients was extremely inhumane. Leila Mir-Ghaffari was released on October 31, 2017, after spending one month in the mental hospital under horrendous conditions. Her release was made possible by public and international campaigns for her freedom. Ms. Mir-Ghaffari had been previously arrested in June 2017 and released after one week on bail. Earlier in November 2015, she had been arrested during a protest outside the Evin Prison and released on bail after one month. The civil activist was also arrested and interrogated in December 2016 for taking part in the memorial ceremony for Reyhaneh Jabbari. In recent months, at least five women have been sentenced to flogging and one or two years of forced labor under inhumane conditions for accepting male friends on the internet. In May 2017, a 35-year-old woman by the name of Mina was sentenced to 74 lashes and two years of forced labor in a mortuary (where the dead are washed before burial according to the Muslim ritual) for accepting a strange man as friend in the social networks. (The state-run Iran newspaper, May 13, 2017. In Article 637 of the Penal Code, ratified in 1996, which has not been annulled by subsequent legislations, the punishment for illicit or improper relations has been designated as 99 lashes. At the same time, the list of examples of computer-related crimes in the law, adopted on May 26, 2009, includes enticement, encouragement, intimidation or invitation to corruption, prostitution, and sexual assault or perversion. According to these laws, therefore, the examination of the cellphone of someone who denies a charge and issuing flogging sentences for her are illegal measures undertaken by the Cyber Police and the Judiciary. Furthermore, the rulings for humiliating psychological torture of the convict such as forced labor or detention in a mental hospital used to crush the personality of Iranian women have not been defined in the regime’s laws and are therefore illegal.